Washington (CNN) – Hillary Clinton met with the FBI for three and a half hours Saturday as part of the investigation into her use of a private email server while leading the State Department, her campaign said. The investigation has cast a shadow over her campaign, and news of FBI agents interviewing the former secretary of state could heighten anxiety among Democrats about the probe. It also has put the Justice Department in the position of having a major say in how the 2016 vote turns out and serves as a reminder of Clinton’s negatives to voters already skeptical of her trustworthiness. An aide said the interview occurred at FBI headquarters in Washington Saturday morning. The FBI declined to comment. The meeting means the investigation into Clinton’s use of a private email server for official business as secretary of state is coming to an end. The question now becomes how long it will take for the FBI to conclude its probe. Within the next two weeks or so, the expectation is there will be an announcement of no charges being brought against Clinton so long as no evidence of wrongdoing emerges from her interview with the FBI, sources familiar with the investigation told CNN. CNN has previously reported no charges were expected to be brought against Clinton because the investigators had not found evidence to warrant charges, according to multiple law enforcement officials. A Democrat close to Clinton said Saturday the campaign believes the FBI will announce its decision before the conventions. Sources familiar with the investigation had previously told CNN the Justice Department’s aim was to wrap up before the Republican and Democratic conventions later this month. The timing is crucial, because if Clinton were to be indicted before the convention, Democrats could perhaps nominate another candidate. 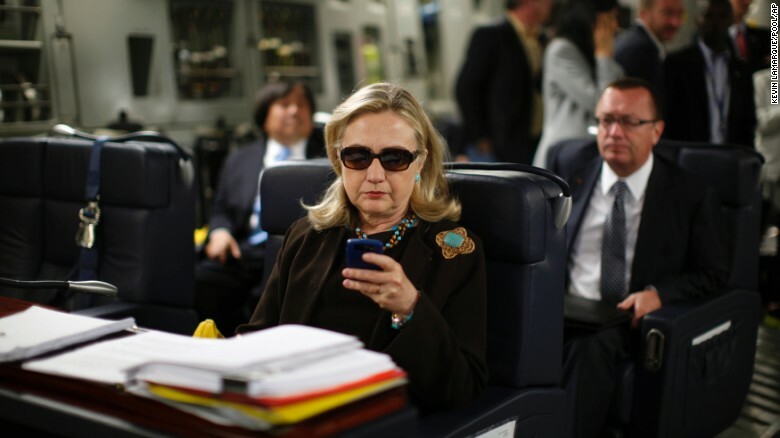 Hillary Clinton, while U.S. secretary of state, checks her Blackberry on a military plane in October 2011. Clinton said she used a private email account for her official work at the State Department and that she did so out of convenience. But she admitted in retrospect “it would have been better” to use multiple emails. Presumptive Republican nominee Donald Trump said it was “impossible for the FBI not to recommend criminal charges against Hillary Clinton.” “It is impossible for the FBI not to recommend criminal charges against Hillary Clinton. What she did was wrong! What Bill did was stupid!” Trump tweeted, referring to the former president’s meeting with Attorney General Loretta Lynch earlier this week that has raised questions about the Justice Department’s impartiality in the matter. Asked by CNN’s Brianna Keilar in a “State of the Union” interview Saturday about the possibility of the presumptive Democratic nominee being indicted, New Jersey senator — and potential Clinton running mate — Cory Booker flatly ruled out the possibility. Please go to CNN to read the entire article. Washington regards itself as the most advanced democracy in the world. It has waged dozens of utterly criminal wars to supposedly spread democracy far and wide. However, Washington’s rhetoric fails to meet the standard of reality. Not only does Washington wage wars that destroy entire nations in the name of “democracy”, but its electoral system is the antithesis of democracy as well. The 2016 elections placed the undemocratic character of Washington on full display when the Democratic Party apparatus anointed Hillary Clinton the “presumptive” nominee just one day before the California primary! According to the Associated Press, Hillary Clinton won all the delegates necessary for the nomination. However, Clinton’s lead has mainly relied on the support of this undemocratic monster called, “the super delegates”. Even after her victory in California, Clinton possesses 1,926 pledged delegates as opposed to 1,615 held by Senator Bernie Sanders. This meant that neither candidate had the required 2,383 delegates needed to clinch the nomination. The Democratic National Convention would have thus been a contested one – or so we thought. However, this fact has been kept in the dark by the controlled, mainstream, US corporate media. CNN, Fox, NBC, ABC, CBS, PBS, the Associated Press, etc., they all made claims the day before the California Primary that Clinton was the “presumptive” nominee. Each branch of the monopoly corporate media counted these so-called “super delegates” along with pledged delegates. However, super delegates often select preferred candidates months before the last state primary. They can change their mind at any point before the convention or during it. Although Sen. Bernie Sanders lost California and will go into the convention trailing Clinton by a significant margin, he can technically still contest the legitimacy of the super delegates, albeit now highly unlikely since for all practical purposes, he has more-or-less endorsed Hillary Clinton. Hillary Clinton is the quintessential candidate of consolidated capital. She first served as a director in Wal-Mart’s corporate board. Throughout the rest of her political career, Clinton has received millions in support from Wall Street. The Clinton Foundation relies solely on the patronage of corporations such as Wal-Mart, GE, and the infamous Goldman Sachs. Her ties to Wall Street and monopoly corporations have led to numerous speaking engagements with these institutions; a point Sen. Bernie Sanders has touched on throughout his campaign. Hillary Clinton’s career as a politician has thus exemplified what it means for US politicians to be bought by the rich and then sold back to the public as “representatives” of the American people. Despite growing popular discontent with social conditions in the US, Washington continues to spend trillions of dollars on endless wars around the world. Nations such as Venezuela have been saddled with debilitating sanctions for supposed “human rights” abuses. Most of the nations that Washington targets place the needs of the people over profit and possess secular, democratic governments. China has called out Washington with a human rights report of its own detailing the numerous instances where the US fails its own standards. The reality is that Washington views democracy as an impediment to the global rule of predatory capitalist profit. Everything else is window dressing. Period!